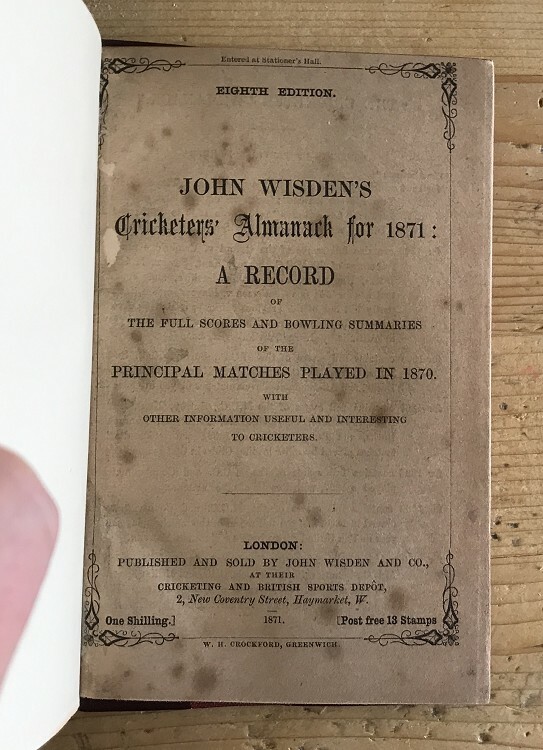 This lot is an 1871 Wisden , Rebound with the original covers bound within. You do not see many first 15 Wisdens with their Original Covers. This rebind is in nice red boards , feel good in the hand, nice pattern inside and ex owners book plate. The boards have gilt to spine and leather(?) corners. The book is complete and the bound in covers are very nice, some spotting but the covers do not have much. Internally there is foxing within the book, the worst page being the title page , some pages are spot free but I would say the spotting runs through the book. The pages otherwise are very nice. A touch of trimming , having checked every page the very top of 135 and 136 page numbers have been trimmed but no loss of text. A rare book. 8th edition - with covers! Postage: Free which covers special delivery fully insured & Jiffy Bag please contact us if form outisde the UK so we can arrange insurance.